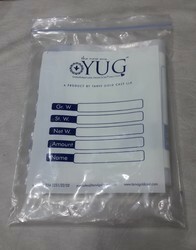 To meet the various requirements of the customers, we are involved in offering a wide assortment of Transparent Zip Lock Bag. Ziploc has expanded their products to more than just sandwich bags. Ziploc products now vary from freezer bags to twist n' loc containers. They have expandable bottom bags which stand on their own. For use when packing non-sensitive devices within an EPA. Bag has zip closure and ESD logo. Made of Polyethylene amine free. Leveraging over the skills of our qualified team of professionals, we are instrumental in offering wide range of LDPE Plain Bag. Being a leading enterprise of this industry, we are offering a huge range of LDPE Poly Bag. We are offering to our valuable customers a wide range of LDPE Bags. These Bags are known for its exceptional quality and unmatched durability. These bags are made available to the customers in variegated sizes and are extensively used for packaging purposes. All sizes from 2' width to 55' in width. We have carved a niche amongst the most dominant names in this domain, instrumental in providing an excellent quality range of Low-Density Poly Bag. We are engaged in offering a quality approved range of DBS Gold LDPE Bag.